Since assuming the office of State Historian I've wanted to host a history conference at Panola College in Carthage. I taught history for four decades at Panola, and as State Historian I have been provided an office and financial backing by the college. Dr. Gregory Powell, President of Panola College, and Vice President Dr. Joe Shannon have graciously afforded me institutional affiliation and constant encouragement. One of my goals as State Historian is to bring an historical event to my home campus. A number of my books and articles have explored the subject of frontier violence, and I have been invited to speak on this topic throughout the West. These activities have shown me the widespread interest in various aspects of this subject. Nothing is more dramatic than life and death conflict, and when that conflict occurs in a frontier setting, there is a special appeal for many Americans. Of course, gunfighting is generally regarded as an activity of the Wild West. But in reality there were frontier-style shootouts, horseback desperados, violent bank robberies, and murderous blood feuds in 19th-century East Texas. "Gunfights and Blood Feuds of Old East Texas" was scheduled for Saturday morning, June 29, at Panola College. The college provided facilities, publicity, refreshments, and other necessary support. I enlisted a longtime friend and award-winning author, Chuck Parsons. Chuck and I have appeared together at a number of similar events. With another friend, Norm Brown, Chuck has co-authored A Lawless Breed, an excellent biography of John Wesley Hardin. A notorious gunfighter, Wes Hardin was a native of East Texas, and a majority of his shootouts occurred in this region. A Lawless Breed was released last month by North Texas Press, and Chuck readily agreed to share with us the latest about Hardin's exploits in East Texas. Chuck and I greeted a lively crowd numbering nearly 100. I began the vicarious action with an account of the Regulator-Moderator War, fought in our back yard from 1840-1844. The Regulator-Moderator War was the first blood feud in Texas, and the largest in scale, with 200 Regulators and 100 Moderators maneuvering against each other in Shelby County in 1844. I also related the 1869 death of desperado Cullen Baker, who was buried in Jefferson, and an 1884 street shootout in Nacogdoches involving Sheriff A.J. Spradley. The 1879 shooting of actor Maurice Barrymore in Marshall brought unwanted attention to East Texas across the nation and in Europe. Headlines across Texas in February 1888 were dominated by a grisly robbery-murder-lynching in Carthage, involving the county treasurer and a deputy sheriff - and a large lynch mob. In 1894 Bill Dalton led a gang to Longview to rob the First National Bank, and a wild street battle erupted. A highlight of the morning was Chuck's presentation of Wes Hardin. There also was considerable interest in my demonstration of the evolution of revolving pistols and holsters. Chuck and I both autographed books, and we enjoyed visiting with fellow aficionados of frontier violence. It was a most enjoyable event, and a number of attendees expressed interest in a future conference. One of my favorite Hill Country towns is Mason. More than four decades ago I carefully researched Fort Mason and crafted a scale model of the frontier outpost. The model still is displayed in the Mason County Museum, which is housed in the community's two-story rock school, built in 1887. I also brought my Traveling Texas History classes to Mason, principally to show them the superb 19th century architecture produced by German-Texan settlers. Fort Mason was established in 1851 atop a rocky hill, and a community named Mason developed below the hill to the north. Fort Mason was a makeshift outpost until 1856, when it became regimental headquarters for the newly-organized Second Cavalry. Col. Albert Sidney Johnston brought six companies of the Second Cavalry to Fort Mason, while the other troops of the regiment were scattered at smaller outposts. Permanent construction at Fort Mason placed stone buildings around a square military parade ground. The lieutenant colonel of the Second Cavalry was Robert E. Lee, who later was promoted to colonel of the regiment. Colonels Johnston and Lee inhabited the commanding officer's quarters, which has been reconstructed on the original foundation. Patrols from Fort Mason saw considerable combat against Comanche war parties. But when the Civil War began the post was abandoned by Union troops. Fort Mason was regarrisoned after the war, but the army left for good in 1868. The deserted buildings provided construction materials for the growing town down the hill, including the school which now houses the county museum. During the 1870s the county was wracked by the vicious Mason County War, also known as the Hoo-Doo War. The end of frontier violence brought steady but slow growth as a ranching center. Skilled German masons erected solid handsome churches, homes, and commercial buildings, many of which still stand as tangible connections to the community's past. The town's large square features shops and restaurants, as well as the Odeon Theater, the oldest continuously-operating movie house in Texas. On the south side of the square is the quaint 1882 jail. The picturesque courthouse was built in 1909. The Mason County Historical Society hosts an annual symposium on some aspect of frontier history. Three years ago, for example, I was privileged to be one of the speakers at a symposium on early Texas Rangers. Noted author Fred Gipson is from Mason, and the Mason County M. Beven Eckert Memorial Library has a fine exhibition on Gipson and his classic novels, Old Yeller and Savage Sam. 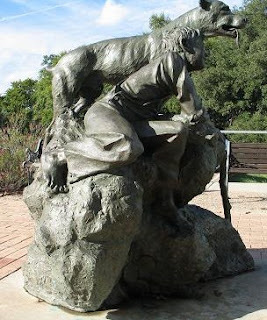 An Old Yeller statue stands outside the library. There is a new museum on the square, as well as numerous historical markers around town. Mason offers much to be savored by Texas history buffs. through the Texas Historical Commission. artillery pieces are sheltered at right. The Mansfield Civil War Battlefield is located in Louisiana, more than 20 miles outside the border of Texas. But even though the battle was fought in Louisiana, it was very much a Texas event, worthy of a visit by history-minded Texans. artillery piece is a 6-pounder field gun. Early in 1864, with the Mississippi River controlled by Union forces, Gen. Nathaniel P. Banks launched a campaign to march through western Louisiana, capture Shreveport (at that point the state capital), then invade East Texas. Banks assembled an army of 36,000 men at New Orleans, while Admiral David Porter readied a large flotilla of gunboats and supply vessels. The combined force marched and steamed up the Mississippi, then angled northwestward up the Red River toward Shreveport. This "Red River Campaign" hoped to confiscate perhaps 150,000 bales of cotton for resale to northern textile mills. Upon entering East Texas west of Shreveport, other targets would include the vast munitions plant outside Marshall, the quartermaster depot at Jefferson, and the arms factory at Tyler, where Camp Ford also held a few Union prisoners. Taylor's army was outnumbered three to one, but Banks marched away from the Red River - and from his naval support - northward into western Louisiana. Banks did not feel threatened by Confederate forces, and he allowed his column to spread out to great length along the narrow Mansfield road. When Taylor confronted the Union column early in April 1864, his Confederate troops actually outnumbered the Yankees facing them. There was a two-hour cavalry fight on April 7, and the following day Taylor arrayed his army in battle formation four miles south of Mansfield. The advance column of Union troops, numbering only 6,400 men, quickly formed a battle line along a rail fence and an adjoining ridge. Taylor ordered Gen. Alfred Mouton to lead his division in attack. At the head of his troops Mouton, who had been severely wounded at Shiloh, was killed instantly by a Union bullet. Promptly assuming command was Brigadier General Camille Armand Jules Marie de Polignac, a French nobleman who was called the "Lafayette of the South." He also was called "General Polecat," by Texans who had trouble with the pronunciation of his last name. General Polignac continued the charge, overwhelming the Union line. Driving home their attack, the Confederates soon encountered another battle line formed by 2,000 fresh Union troops. The Confederates routed this line, too, capturing a great many prisoners, small arms, and abandoned wagons. Union forces established a new position at Pleasant Hill, a few miles to the south, where fierce combat took place throughout April 9. Both sides suffered heavy losses, but the entire Union column began a withdrawal the next day. Reuniting with Admiral Porter's flotilla at Natchitoches, the Union expedition engaged in a compete retreat, and the Red River Campaign ended disastrously. Camp Ford swelled rapidly and became the largest POW camp west of the Mississippi. The Prince de Polignac was promoted to major general. These monuments are near the park entrance. The Mansfield Historic Site is a 177-acre park featuring a museum that has just undergone a major renovation. There are handsome monuments, and an interpretative trail and a long rail fence. During the Civil War Centennial, 1961-65, the Texas Civil War Centennial Commission conducted a program to place monuments across the nation to honor the contributions of the Lone Star State's military units. The monuments were of native pink granite, cut from historic Texas quarries, and in 1964 one was placed at the Mansfield site. And in April 2014 a weekend-long reenactment will celebrate the 150th anniversary of the Confederate victory at Mansfield. 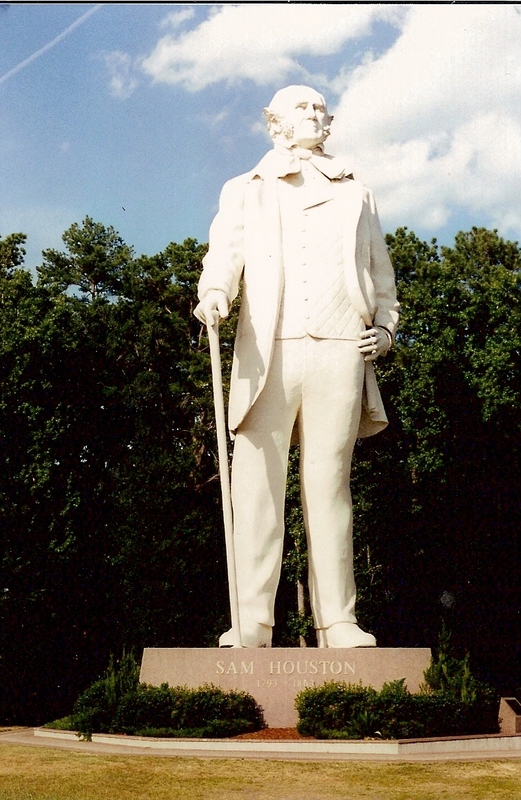 Sam Houston is a Texas icon, an incomparable military and political leader of the 19th century. 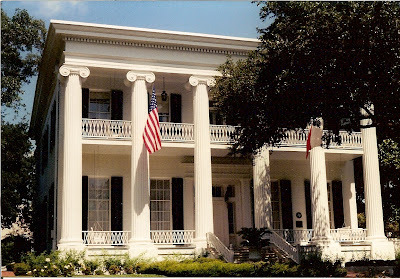 The restless Houston traveled throughout the Texas of his day, but the most tangible reminders of his remarkable past are clustered in Huntsville. As a boy in the early 1950s I remember my excitement when my parents brought me to the Sam Houston Memorial Museum, located across the street from the college campus named after the Texas hero (in the 1950s the school still was known as Sam Houston State Teachers College). 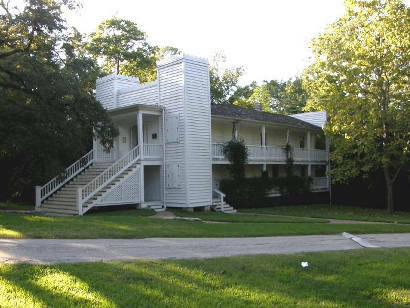 We toured Houston's "Woodland Home," as well as the "Steamboat House" where he died. In later years I brought my daughters for a visit, and I toured numerous classes of my Traveling Texas History Course from Panola College. Before coming to Texas in 1832 Houston was a United States congressman, major general of Tennessee militia, and governor of Tennessee. In Texas Houston became a leader of the independence movement, famously signing the Declaration of Independence from Mexico on his 43rd birthday. Appointed general of Texan forces, Houston's "Runaway Scrape" campaign climaxed at San Jacinto in a spectacular victory over Santa Anna's army. "Old Sam Jacinto" was overwhelmingly elected president of the fledgling Republic of Texas, and later he would serve a second presidential term. 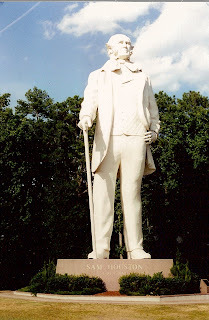 When Texas achieved statehood Houston served as U.S. senator from 1846-1859, then as governor from 1859-1861 (he is the only politician ever to serve as governor of two states). In 1840 the twice divorced Houston, now 47, married 21-year-old Margaret Lea. Despite his late start, the couple would have eight children together, four boys and four girls. In 1847 Senator Houston acquired a 233-acre farm just south of Huntsville for his growing family. "It is a bang-up place!" wrote Houston proudly. 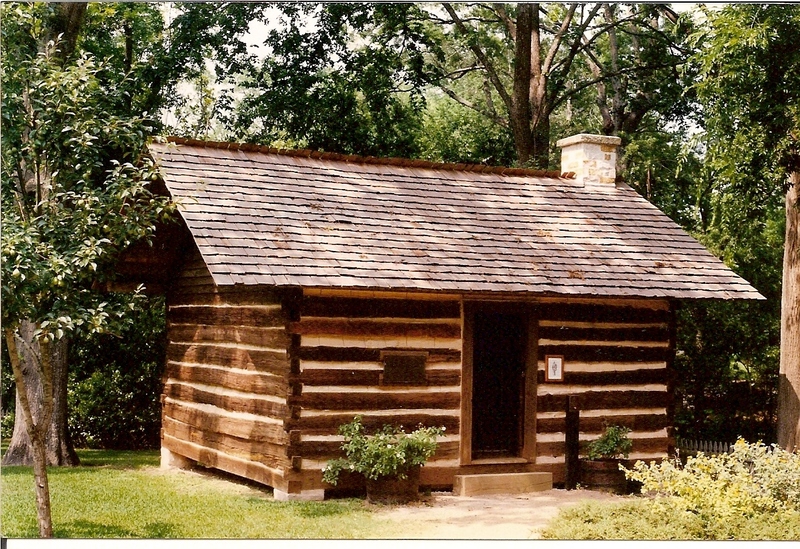 There was a one-room log cabin on the property, but Houston added a second room, with a dogtrot separating the rooms. 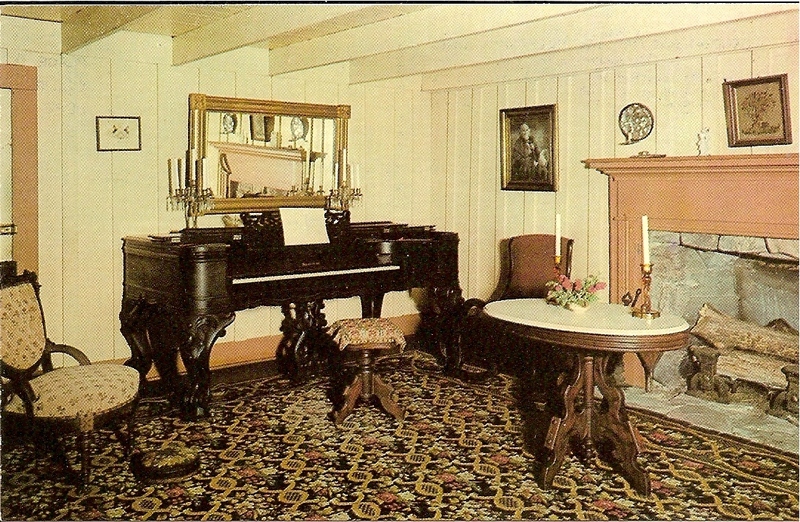 One room was a parlor, while Sam and Margaret used the other room as their bedchamber. 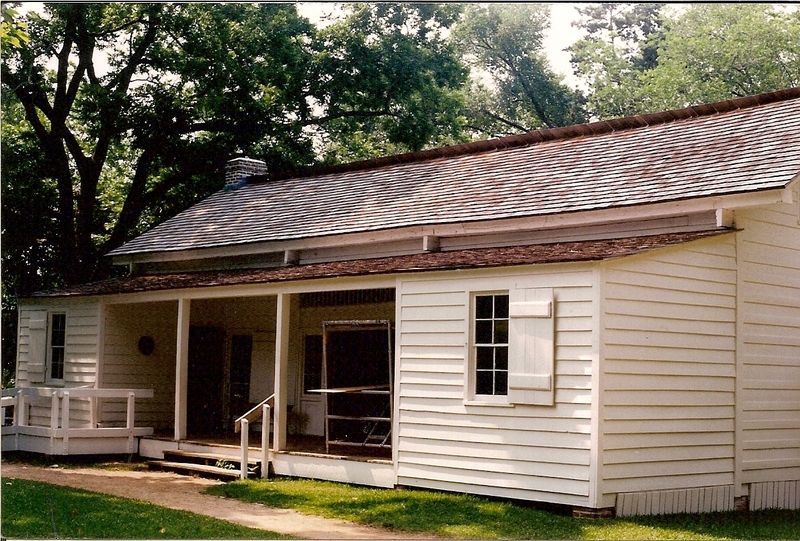 A dogtrot stairway led to two sleeping rooms under the roof: the boys slept in one loft and the girls in the other. 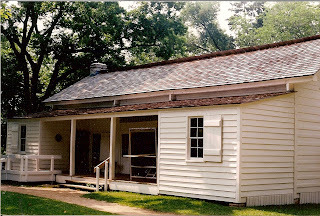 Two small rooms connected by a porch were added to the rear. One was for guests and the other for Margaret's mother. Surrounded by trees, the house was dubbed "Woodland Home," and Houston sometimes called it his "Wigwam." 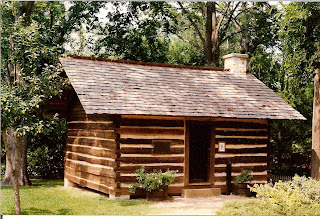 In the yard a one-room log building served Houston as a law office. 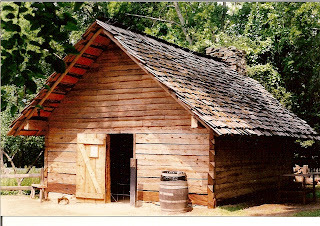 There also was a kitchen, smokehouse, barn, stable, carriage house, chicken coop, outhouse, and slave quarters. The furnished house and law office remain intact, and much of the rest of the complex has been reproduced. In 1859 Governor Houston moved to the three-year-old Governor's Mansion in Austin. There Margaret gave birth to her eighth child in 1860, and Temple Lea Houston became the first baby born in the Mansion. But when Texas seceded from the Union and joined the Confederate States of America, Governor Houston refused to swear an oath of loyalty to the Confederacy. The office of governor was declared vacant, and the Houstons moved back to Huntsville. Houston had sold the Woodland Home, but he found a rental property on a hill east of his old home. In 1858 Dr. Rufus Bailey, president of Austin College in Huntsville, built the "Steamboat House" as a wedding gift for his son. The house was built to resemble a Mississippi River steamboat. But the newlyweds hated this eccentric house and refused to live in it. Therefore it was available when Houston returned to Huntsville. By the time he was 70, Houston was ill, and he died in the Steamboat House on July 26, 1863, muttering, "Texas...Texas...Margaret." Houston was dressed in a black suit and his Masonic apron, and his coffin was built by Union prisoners of war. 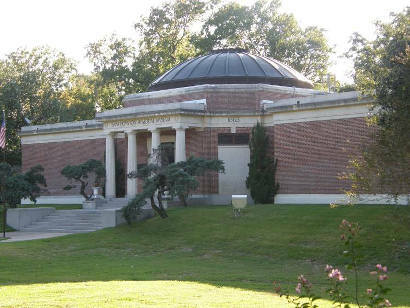 Funeral services were held in the upstairs parlor of the Steamboat House, followed by burial with Masonic rites in Oakwood Cemetery. Houston died downstairs in the Steamboat House. In 1879 Sam Houston Normal for Teachers opened in the old buildings of Austin College, which had moved to Sherman. The historic log and clapboard Woodland Home became a boarding house for young ladies who attended the nearby teachers college. In 1910 students raised the modest sum necessary to purchase the aging house. The Texas Legislature appropriated $15,000 in 1927 "for further restoration and Maintenance of the old home." 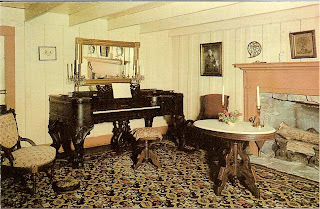 In 1936 owner J.E. Josey donated the Steamboat House to the State of Texas, and it was moved to the 15-acre site where Woodland Home and Houston's old law office stood. The buildings were opened to the public, and the Sam Houston Memorial Museum was erected. Today the park has been supplemented with a modern visitor center. There is an impressive monument at Houston's grave at the center of Avenue I and Ninth Street. And a towering image of Houston, south of Huntsville on I-45, is visible for more than six miles. Made of 60,000 pounds of concrete and mounted atop a 10-foot granite base, the 66-foot statue is an appropriate representation of the larger-than-life Houston. A visit to Huntsville offers a rich tribute to one of the most important and colorful figures of Texas history. I first toured Fort Belknap in 1965, but it has been a decade since my most recent visit. There is a new caretaker, Eddie Perez, who as a boy toured the old fort annually as part of the field trip program of the Olney Elementary School. Eddie enthusiastically showed me around and answered a great many questions. Fort Belknap was founded in 1851 by Gen. William G. Belknap, commander of the Department of Texas. The army tried to establish the post a couple of miles to the north, where Newcastle now stands, but two water wells were dry. Fort Belknap shifted to its present location, although the water supply continued to be a problem. A four-company post was erected, and several buildings were constructed of stone. In 1854 the State of Texas provided 70,000 acres for two Indian reservations, Brazos Reservation and Clear Fork Reservation. Fort Belknap provided supplies and tools, as well as troops to control trouble between the Indians and white settlers, who coveted the reservation lands. The reservation experiment lasted only until 1859, when the Indians were removed to Oklahoma and the reservations were opened to settlers. A Butterfield Overland Stagecoach station was located at Fort Belknap, and just outside the military property the town of Belknap developed. But in 1859 the fort was closed, although a maintenance detail remained until 1861, when all federal troops left Texas. 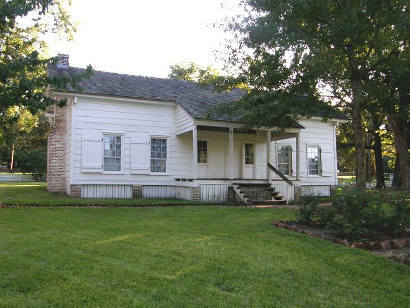 During the Civil War, Texas Confederate troops occupied the old outpost for a time. There were strikes by Comanche warriors, including the ferocious Elm Creek Raid of October 1864. In 1867 federal troops returned to the Texas frontier and began refurbishing the fort's buildings. But the establishment of Fort Griffin in the region resulted in the final abandonment of Fort Belknap. The town of Belknap declined rapidly; today only the community cemetery remains. There was a great deal of "midnight requisitioning" at Fort Belknap, as area settlers took building materials from the abandoned fort structures, which fell into ruin. But during the Texas Centennial of 1936 there was a restoration effort. Fifteen acres of the eastern part of the old military reservation were set aside as a county park. The massive stone powder magazine remained intact, and the long walls of the old "corn house" (where grain and fodder were stored) still stood, and were repaired. Some of the buildings in Newcastle that had been constructed of fort materials were purchased and dismantled for the stone. Five buildings were rebuilt with original materials on original foundations. Three barracks stand in a line, with a reconstructed kitchen nearby. The two-story commissary also was rebuilt, with a museum on the ground floor. There also are displays on exhibit at the corn house. Family reunions often are held at Fort Belknap, and so are conferences by history groups. School field trips still tour the fort, along with vacationers. A large brush arbor frequently is utilized. During the 1850s Fort Belknap was a substantial and important outpost, one that is well worth a visit today.